There are loads of restaurants in Shanghai. The choice is great in terms of variety of cuisines. There is no such thing as Chinese cuisine or a Chinese restaurant. You’ve got Shanghainese, Cantonese, Sichuanese, Hunanese (both of which are super hot, though in a different way), Dongbei (literally eastnorthern, i.e. from Beijing and the northeastern provinces), Xinjian (from western China, where Muslim Chinese communities are) and Taiwanese. In terms of international cuisines, there’s French, Italian, Japanese, Russian, Indian, Thai, Vietnamese, Moroccan, etc., French-Chinese Fusion (like Yin by Le Garçon Chinois) or other cuisine “fusioned” with Chinese, whatever that is. On top of this, you’ve got trendy and less trendy restaurants. People 7 is trendy, so is Yin, but in a totally different way. Da Marco isn’t but it offers good hearty Italian dishes. Prices also cover a really wide spectrum. The gastronomic(al) end is not underrepresented with Maison Pourcel, Jean Georges, Franck or Mr. and Mrs. Bund. Food is in fact almost everywhere and at the other end of the price spectrum are local eateries. These are tiny restaurants, seating between 4 and 10 people and are often partly sunken below the street level. They’re characteristically devoid of any type of decorum, looking almost improvised. Many just have plain white walls, just painted or covered with white ceramics. The tables are also very basic, often in white formica or plain wood, and the kitchen tends to be visible, either at the front of the place (sometimes outside) or on the side. Some of the front kitchens are extremely filthy and obviously you’d never ever eat there. 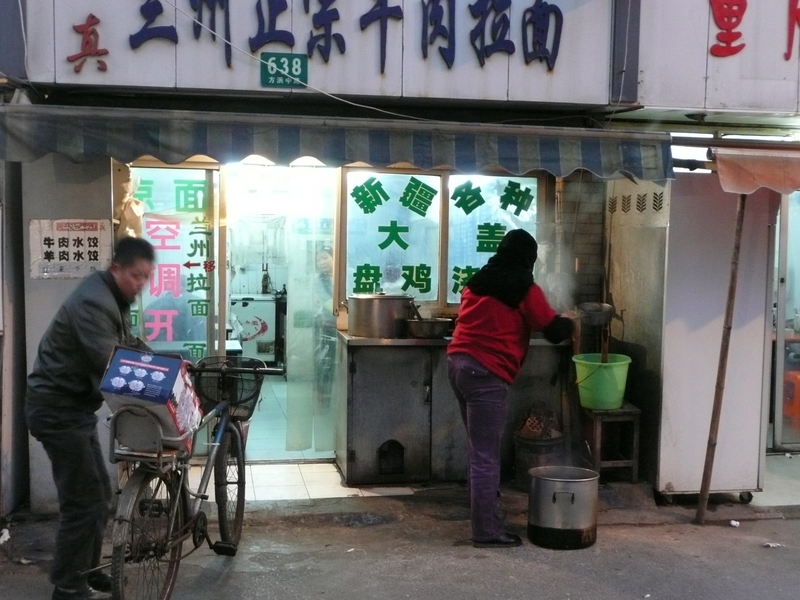 But many of these local eateries look very tempting. The smell of the food and the heartiness of the meals served is just so appealing… Maybe it’s also the fact that they cater for an exclusively Chinese clientele that makes me want to experience eating there. However, you feel you can’t just go into one of these, but have to be introduced. I discovered that my friend A. shares my curiosity for these eateries. I therefore asked him if he’d be interested to try the one most recommended by my Shanghai Time Out guide. 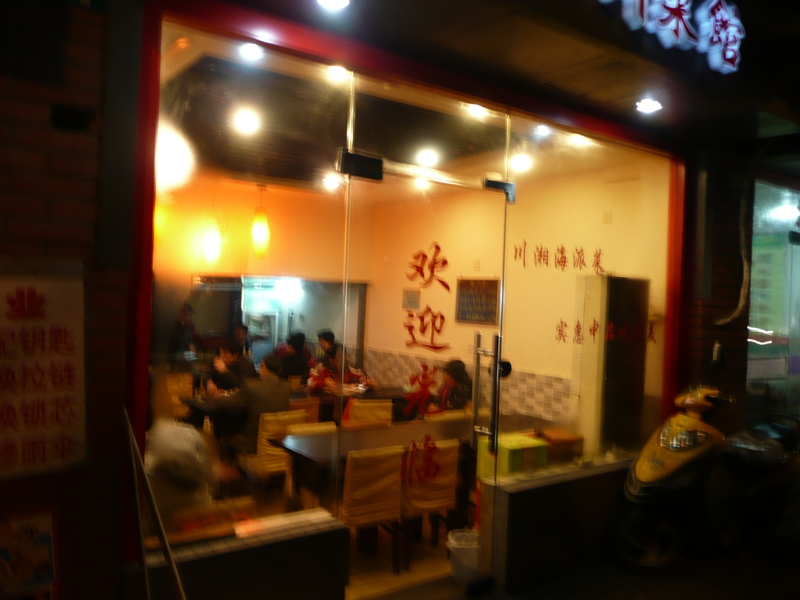 The date was immediately set and we met at Chun’s on Jinxian Lu (Road). We got there and pushed the door only to be greeted by a lady shouting at us “Mei you, mei you!” (I don’t have or there is no) and unambiguously kicking us out with her free hand. Given we don’t speak Chinese well enough yet, it wasn’t clear to us whether she didn’t have any food anymore for the lunch slot, which is common in these places as the menu is limited or non-existent, or because it was simply personal (there was an empty table). Thankfully, we barely had time to ponder on our disappointment as another door, two shops away, opened and another lady with a smile invited us with her forthcoming hand gesture to come into her place. Although the place had the size of the local eateries, it was a bit of an upgrade in terms decoration and menu. The experience was no disappointment. For less than 4 pounds each (very upmarket eatery! ), we shared generous portions of warm tofu served with a bit of egg yokes and chives, steamed bean sprouts in a sweet sauce and minced pork cooked with ginger and a sweet sauce too. An egg was half buried in the meat and the bottom half of the yoke was amazingly yellow and translucent. I curse myself for not taking any pictures of the food! There was some confusion over the braised pork I thought I ordered and which was never served. What we had was actually enough and the sight of the mid-aged over-dressed Chinese ladies lunching behind A. made this meal perfect. The very bottom of the food chain is in reality street food, but I’ll leave this for another post when I’ve had more of it. Well, it was after I ate there… Thankfully, it all went very smoothly but am now on the look out for blue gallon/finest China!